I own an HP computer with Windows 7 and many of my programs keep crashing for no apparent reason. One of the biggest problems I have is that Windows Explorer crashes, then my desktop is reset; this happens over and over again, making it impossible to use the computer. I've scanned for viruses and malware and nothing as turned up. As such, I would like to reset the computer to factory settings and wipe out the entire hard drive, similar to when I first purchased the computer. There is something called HP Recovery Manager, but I don't fully understand what is the difference between a system restore and system recovery? Can you help? " 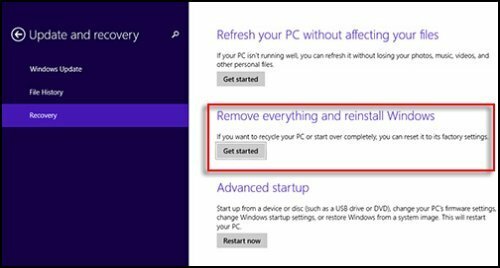 Rolling back a Windows Restore Point (also sometimes referred to as a "system restore") allows you to partially revert the system back to a time when it was working properly. Reverting a restore point usually only affects the system registry, drivers, and some DLL files - and not all the data on the hard disk (C drive). As such, reverting a restore point may not 'fix' your problem. In contrast, a System Recovery will wipe out the entire drive and all user data and reset everything to 'factory specifications', allowing the system to operate from a previously 100% working state, just as when you first purchased it. If your computer is extremely problematic and you cannot revert a Windows Restore point, or if you don't have any disk image backups to restore, then running the HP System Recovery is definitely what you want to do - but only after you backup your data, first. For those of us without an HP system, a "windows reset" whereby you select the option to "remove everything and reinstall Windows" is the same as a "system recovery". If you still have errors with programs crashing after a System Recovery is issued, then you most likely have a hardware problem - at this point it's usually a bad motherboard or RAM, or possibly a heat dissipation issue. It is extremely rare that the CPU is defective, though it's possible. By far the best program used to test the stability of the system hardware is called Prime95, which runs from within the Windows desktop. The design of this program is to run complex math calculations; if the computer is unstable, then this program will report an error in its calculations, which then means you have a hardware problem. Simply run the program for 24 hours using the 'torture test' using the "In-place Large FFTs (maximum heat, power consumption, some RAM tested)" setting. If you want to test the RAM exclusively, then you can download the Memtest x86 .ISO file (free edition) and burn it to CD, then boot from the CD and let that run for a day. If you have any errors running that test, then you definitely have bad RAM and will need to replace one of the modules. I suggest you run this program after running Prime95 as it focuses strictly on RAM. In either case, a bad motherboard or RAM or even heat dissipation issues will cause repeated program crashes in Windows, especially after you have done a factory reset. You can think of the factory reset (or System Recovery) as a 'base foundation' to which Windows should work properly from. If it still doesn't work after the System Recovery has been issued, then there is a very, very good chance you have a hardware problem. When we get what seems to be a hardware failure but we need to distinguish it from far more frequent Windows failure, then we boot up from a Slax Linux 'live' CD. If the machine runs perfectly well in Linux but crashes very quickly in Windows, we start by blaming Windows - it has always been correct. I suggest this because it is a lot quicker than your method, though yours may be more reliable if it gets the machine very hot. The advantage of the Linux method is that it mostly eliminates time wasted re-installing if the machine is found to crash when Windows isn't running, but doesn't delay getting on with curing the problem otherwise. Best wishes, newsletter always interesting. 1. The user having the problem never mentioned if he has this problem after booting into Windows safe mode. It's worth trying that before doing anything drastic. If it's okay in safe mode, it is of course a Windows problem. 2. If safe mode works, it might be worthwhile running System File Checker in safe mode ("sfc /scannow"). 3. If the above doesn't help, explorer.exe often crashes due to flaky Context Menu extensions. In safe mode (if that is working), I would use Nirsoft ShellExView - Shell Extensions Manager (http://www.nirsoft.net/utils/shexview.html) to disable as many Context Menu extensions to explorer.exe as you can. Simply right-click on the extension in ShellExView and choose "Disable". Then reboot to see if that helps. 4. If trying a System Restore Point and the above don't work and it's not a hardware problem, I would NOT do a "System Reset". I would do a Windows 7 no-reformat, nondestructive reinstall. By doing so, you replace the Windows operating system without having ANY impact on the applications or data. I like to compare it to replacing a person's bones without impacting anything else in their body. I've done it several times (in Windows, not on people). It's not too difficult to do and it works. 5. I would only do the "System Reset" if none of the above works. P.S. If anyone is interested, I would be happy to post the step-by-step procedure for a Windows 7 no-reformat, nondestructive reinstall here, but you can also probably find it on the Internet. HP Windows 7 crashing many progs.. Try Hoovering the fan and vents and the lint dog hair etc from inside the system case, i did and my old Dell is now working fine.. i know nothing about computers but this worked like Einstein.. all the best infopackets..